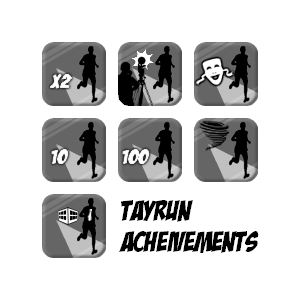 Secondly, if you are truly interested in being a part of TAY Run Club, leave your name below. For this week only, just keep track of all your points yourself and I'll get a spreadsheet up on google docs or something once I know who all is going to play, where you can enter in your points. Also a note on points as there was some confusion and some amendments to the original game plan. Any exercise is welcome. Just use time instead of distance. If you can come up with some conversion - ie. my cross country coach used to say that 3 miles on a bike was equivalent to 1 mile of running - then I can accept that. The more the merrier so whatever you wanna do is fine, just wanna make sure that we all earn points roughly at the same rate. Points are earned EITHER via time OR distance. Not for both. 10 minutes on a treadmill where you run one mile = 1 point, not 2. This week only points are earned at half rate and can be banked. No power ups can be used this week. Maximum points that can be banked is 6. As the points are earned half speed this week you may end with a decimal. Round up on Saturday night as long as it doesn't put you over 6 points. That's all I got for now. Hopefully we can have some fun with this, I'm thinking if enough people sign up then I might split the group into 2 and we can have two competing teams (TAYvillains vs. TAY lightbrigade) race to finish level 8. So if you want to indicate which team you'd like to be on when you sign up that would be helpful as well. And again, thanks to Kaploy! If anyone wants to give the power ups a shot, that'd be great too. Point entry form is here.